It was this cartoon that started my trend of illustrating the Pharisees as being in dark blue/purple robes & turbans. All later cartons with Pharisees depicted can trace their colour schemes back to this cartoon. The chief Pharisee has a golden sash. 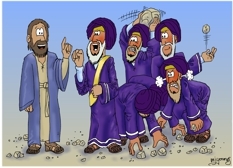 The heavy rock-bearing bloke is not aiming to bash the head of the chief Pharisee, but is looking at Jesus! By telling the Jews “before Abraham was born, I am!” Jesus was effectively saying that He was God, which is what upset them.